UF Health surgeons provide quality, innovative care to patients with pancreatic, liver and biliary diseases. We offer the latest in surgical care for both benign diseases and cancer, including laparoscopic procedures for patients who are candidates for minimally invasive surgery, as well as personalized care and treatments to optimize each patient’s outcomes, and emphasize coordinated care to streamline clinic visits and hospital procedures. As part of our mission, investigative treatments are available for appropriate patients as we strive to continually improve patient care and outcomes. 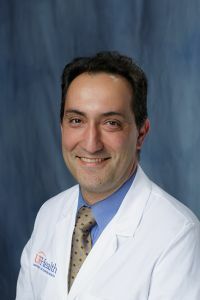 UF Health pancreatic and liver surgeons work closely with gastroenterologists and other specialists from the University of Florida Health Gastrointestinal (GI) Oncology Center to provide a comprehensive, compassionate and multidisciplinary approach to caring for patients diagnosed with cancers of the digestive organs. UF Health pancreatic and liver surgeons care for patients from throughout Florida and the nation. Up-to-date volume and outcome data is openly provided during consultation. To learn more about pancreatic diseases, visit: the National Institutes of Health or the American Cancer Society.